Here is an interview with Jaime from Oxford, Michigan, who found help with Dr. Ward’s upper cervical chiropractic care. Was there a specific problem that led you to try NUCCA Upper Cervical Chiropractic? How was it affecting your quality of life? Frustrated. Tired. Irritable. No energy and motivation. What had you done previously to help improve this problem? Over-the-counter medication. Massages. Other chiropractors. What kind of improvement have you seen over the course of your care so far? How do you know that they are improving? There’s less need for augmenting with medication. More energy. Would you recommend Dr. Ward’s approach for the purpose of helping others? If yes, do you have anything to share that might encourage others to try NUCCA upper cervical care? Stay with the therapy. Stay consistent with appointments. It’s a non-invasive approach that’s not painful. I’m pleased with my progress thus far. Looking forward to having headaches become a thing of the past, or continuing to become more infrequent as I progress. Research: Patient satisfaction with upper cervical chiropractic care. I have a reverse cervical curve. Is this a problem? Can you fix it? 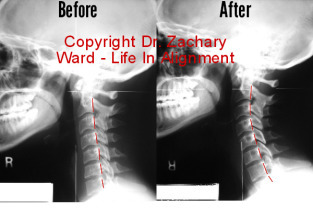 Upper cervical chiropractic at Life In Alignment is different. And different is good. There are common patterns to spinal breakdown that must be corrected for the best changes in symptoms. We focus on the areas that get the most return on your investment. All healing takes time. But outside evidence of positive inside changes should be quick in coming. View images from the before and after gallery to see what kind of results you might be able to see in your own spine. Relief care, corrective care, or long term wellness.Find out what it's going to take for each, and then pick the plan that fits your goals, budget, and lifestyle. What are my treatment options for Trigeminal Neuralgia? What is Trigeminal Neuralgia and what causes it? Upper cervical chiropractic and torticollis (congenital)? Three millimeters to headache freedom?